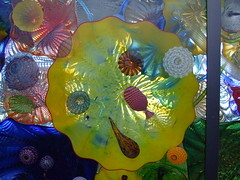 Chihuly's glass ceilings often resemble fantastic seascapes, coral reefs of glass that spread out in inverted splendour. 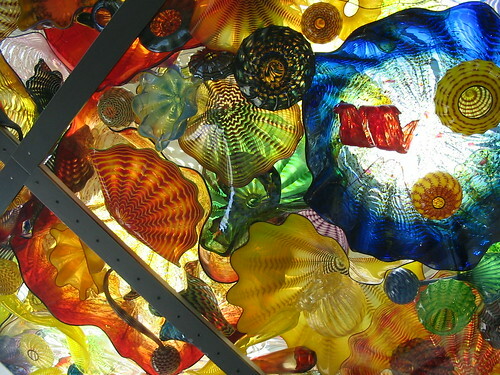 The bridge takes things further, the glass works laid on glass, allowing Chihuly to layer additional forms. A wonderful view. One I could have looked at for hours. I found it really funny, the last time I went, to watch people setting up tripods and standing still, very carefully lining up every shot just so even as I just walked through with my point and shoot pointed upwards, holding down the shutter at random moments. This is so lovely. I've looked at all the pictures on his website. I'd really like to get to see this myself! Thank you for sharing your pix!